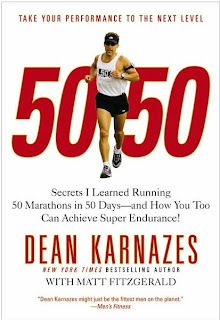 A few months ago, I read a book by Dean Karnazes, 26.2 Stories of Blisters and Bliss. Like anyone else that has become acquainted with this endurance superstar, I was totally amazed. In addition, it got me thinking about the whole ultra-distance concept and I posted a few thoughts (click: e That's CRAZY!) As I talked to others about his accomplishments, runners and non-runners, the overwhelming response was "how is that even possible?" Fast forward to late summer and one of my favorite running blogs, Old Man Running. 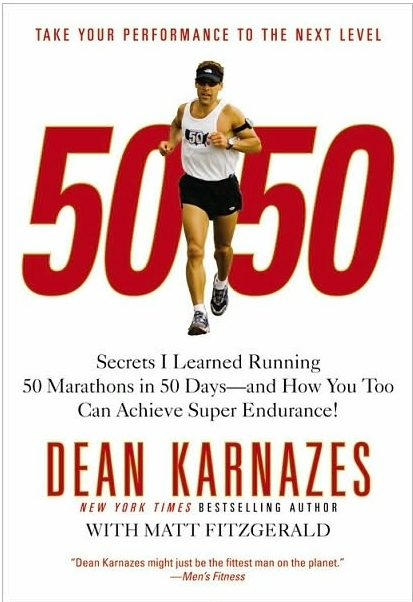 The author was giving away copies of an earlier Karnazes book, 50/50 : Secrets I Learned Running 50 Marathons in in 50 Days! Thanks to the generosity of the self proclaimed running "geezer", I received mine in the mail last week. Already, I can't put it down. Not only have we started out on the 50 races in consecutive days, but now I learn that he does them in 50 different states. Incredible! So, the point I wanted to make is really based on Dean's personal introduction to the book. In it, he sums up my exact feelings on the subject of personal motivation and our bodies ability to do things that we can't even imagine. If I've said it once, I've said it a thousand times, I am a living testimony to the fact that anyone can go from average fitness, hardly capable of running around the track, to logging 1,500 miles a year and completing marathons with the mindset of not just finishing, but finishing a little faster than the last one. I promise, if I can do it, anyone that wants to become a distance runner can do it. Five years ago, I would have laughed at the notion that running multiple days a week was even a possibility. Then, if you would have told me that 8, 12, 16 mile runs would come as easy and natural as running a 5k, well, I'm not sure what I would have done. Probably told you to stop with all that silly, nonsensical talk! No way that average Dave would ever run like that. Glad I listened more to people like Dean, and less to people like me!